My artist’s sketchbook has become a powerful tool which I use almost daily. Although there are many digital ways to document and organize work, the physical act of putting pencil to paper jumpstarts my creativity My sketchbook lives close by my workstation, ready for notes about the tracks I am working on – my impression of what’s working, what’s not, chord progressions, ideas to try, etc. It’s also handy for writing down numbers (ie. delay times) or (gasp!) error codes. I prefer the larger-sized books (11′ x 14″) since I like having a lot of open space. 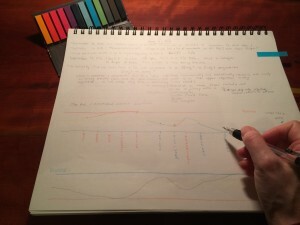 When I’m working on arrangement or song structure, I find it helpful to draw a graph of the emotional arc of the track (which is what I’m doing in the photo), to help visualize the shape. Often, new ideas and patterns emerge from this perspective. Colored pencils can reveal additional insights as well. By the end of each book, with all the writing and diagrams, things can start to feel a little wooly, so I use bright, colorful, sticky page markers to help me find more important notes. Using the sketchbook makes it easy to look back and calculate the time it took to complete different tracks. Another benefit is being able to leaf through old books and revisit ideas, see progress, or find new inspiration.